Rumor! Radiohead to play the Zodiac? Ah, the Zodiac in Oxford. If there was ever a club that could be associated with early Radiohead, it’s this one. Back when Radiohead was just practicing on Fridays, this place was called the CO-OP Dining Hall and later named The Venue. The video for “Creep” was shot here and at one point, the band’s management helped fund it’s re-opening in 1995. Needless to say, this place is a historic Radiohead hotspot. This Is Oxfordshire has a story about the venue expanding their capacity and transforming to a “club of the future”, whatever that means. The plans will see the club partially demolished and rebuilt with three separate venues under the same roof. The total capacity will increase from 750 to 1,150 – much of that catered for by a new main venue, capable of holding 900 people, to be renamed The Carling Academy Oxford. 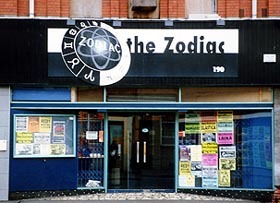 The Zodiac’s name will live on, though – giving its name to a smaller 436-person upstairs venue, which will host new bands. The third element will be a stand-alone bar and club, to be called Bar Academy, which will hold 280 people. Due to fire regulations, the three venues will not operate at maximum capacity at the same time. Work will start in mid-May, and see the club closed for four months. Its re-opening in September will be celebrated with a party. AMG remains tight-lipped over who could appear, but refuses to rule out the city’s greatest musical export, Radiohead – members of which formerly had a financial interest in the club. Keep in mind folks, this is a rumor. We’ll keep you updated. Previous post: Radiohead to sign with Starbucks…. NOT!